Kiko is a brand that has been doing the rounds on beauty blogs/Youtube for a while now, but I still feel like a lot of people are a bit wary of trying it out since it's still a fairly new brand, plus they have so many products it can be a bit overwhelming! 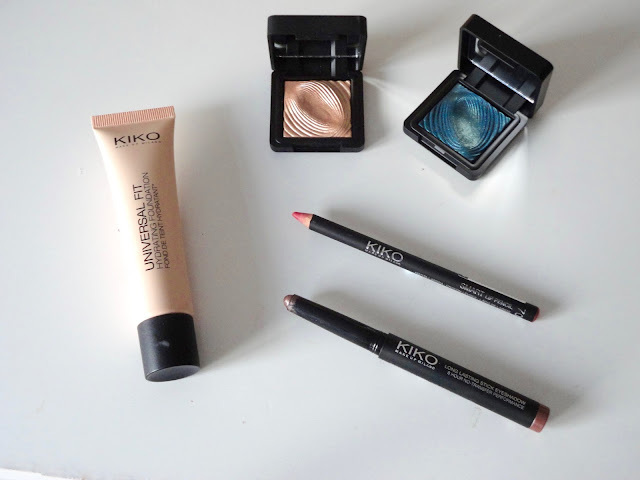 So, today, I thought I'd do a quick round up of all things Kiko that I've tried and what I'd recommend. First up, the Universal Fit Hydrating Foundation - you can see my full review of this here. It's a nice medium coverage foundation that is certainly very hydrating and looks nice and fresh on the skin. It's not really dewy, but it's not matte, so I'd say it's a nice satin finish. I like the tube packaging as it allows you to squeeze out as much or as little as you want so you're not wasting any product. It's fairly long wearing - I'd say 5/6 hours before it needs touching up. They have a bit of an odd colour range - I found it quite confusing to find my shade, so I'd recommend waiting until you can get to a store before trying it. Next are Kiko's eyeshadow offering. I first tried their eyeshadow stick in 06 (which is a pretty good dupe for 'Misty Rock' from By Terry btw! ), and I love it - you can see my full review of this here. Such a gorgeous pinky/purple with a slight silver undertone that has fantastic lasting power and is really great to add a bit of colour if you're more of a neutral girl! For powder eyeshadows, their Water Shadows are absolutely fantastic - you can see my full review of them with swatches here. So, so pigmented and the most gorgeous, unique colours. I have 208 (dupe for Laura Gellar 'Gilded Honey'! ), and 213, which is a stunning greeny/blue shade that I used to create a green smokey eye, and it gave the most beautiful shimmery colour! I've only really used 208 as a highlighter so far, but I imagine it would be beautiful all over the lid or as an inner corner highlight. Finally, I have their lipliner in 702, which is a soft pink/coral shade. I have to be honest, I've not really given this a proper go yet, mainly because I tend to reach for my MAC or Rimmel lipliners a bit more. For this one, I'd maybe give it a miss and go for something from Rimmel instead - their lipliners are beautiful and definitely more accessible than Kiko! So, there's my little round up of my Kiko collection! I'd love to know what your recommendations are from Kiko - let me know in the comments.